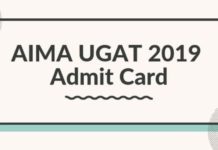 RMAT Admit Card December 2018, or the AIMA PhD-RMAT hall ticket has been released at aima.in for those candidates only who have filled the application form of RMAT and submitted with requisite documents. AIMA RMAT 2018 will be held on December 15, 2018. RMAT Admit Card 2018 can be downloaded by using RMAT Online Auto Generated RMAT Registration Number from AIMA website. Candidate must affix passport size photograph and get it attested by the Gazetted Officer before appearing in the exam. This document is very important from the examination point of view and must be kept safe. Latest: AIMA RMAT Admit Card Dec 2018 has been issued. Access the link below to download admit card. 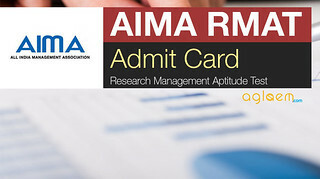 Admit card for Research Management Aptitude Test (RMAT) is issued by AIMA for the examination. Admit card contains the Roll Number and Test Centre Address. Admit card is an essential document and candidates must bring there admit card at the time of examination. No separate Admit Card will be issued. The link to download RMAT Admit Card 2018 is also provided below for the candidates. Admit Card: Click here to download AIMA RMAT Admit Card Dec 2018. Admit cards can be downloaded by using the RMAT Registration Number. Candidate must take the printout of RMAT 2018 admit card from the website. The RMAT Admit card 2018 will have the Roll Number and Test Centre Address. No separate admit card, apart from the online generated one, will be issued. Get the photographs on the admit card attested by any Gazetted Officer. Candidate must present the RMAT Admit Card 2018, duly completed at the test center for appearing in the exam. The admit card will be verified and signed by the Invigilator during the test. 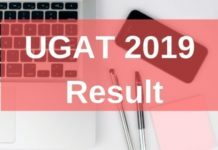 The upper half of the admit card will be collected by the Invigilator and the lower half will be handed over to the candidate. Candidates are to report to the allotted test centre at least 45 minutes before the scheduled commencement of the test. Neither any candidate will be admitted 15 minutes after the commencement of the test nor any extra time granted for completing the test. Document: Admit Card duly completed. Writing Materials: Ball Point Pen, HB Pencils, Eraser, and Sharpener. The test room will be opened about 30 minutes before the commencement of the test. The candidates are to be seated at the allotted place. Your Admit Card will be verified during the test. One part of Admit Card will be given to you as proof of your having appeared in the test. Please ensure that this is duly signed by you and the test invigilator. Candidate will be allowed to leave the test room after the completion of the test and only after permitted by the invigilator. If you wish to leave the room during the test, you must have the invigilator’s permission. You will not be permitted to make up the time you lose. Blank sheets for rough work will be provided if required. All centers are closely monitored for security and candidates’ identity and activities will be recorded using web cameras and/or closed-circuit TV cameras. Anyone violating the rules of the test center will not be allowed to continue with the test and will be automatically disqualified. The test will consist of multiple-choice questions pertaining to the indicative topics mentioned in Parts A and B. There will be no negative marking for a wrong answer. To become eligible for the Interview the candidate has to obtain at least 50 percent marks in the test. Part A – Basics of Management:- Functions of managers in business organizations; Managerial skills and levels; Meaning Power and authority; Functions of human resource managers; Fundamentals of human resource management- recruitment, selection, training and appraisal; Functions of marketing managers; Concepts and components of marketing mix; Functions of finance managers; Indian financial systems; Basic accounting concepts; Balance sheet and its components; Globalization of business; Functions of operations managers; Statistical quality control techniques; Inventory costs and simple models; Elements of business environment. Part B – Research Fundamentals and Aptitude:- Decisional and research problems; Steps in research; Primary and secondary data;Types and properties of the four types of scales used for data collection; Population and sample; Types of sampling methods; Methods of data collection; Data interpretation; Types of variables; Logical reasoning; Research and teaching aptitude; Research ethics; Overview of higher education system in India. If you have any queries regarding RMAT 2018 admit card, please ask in comments below.